In celebration of its 50th Anniversary of football cards, Topps continues with its year-long "Turn Back The Clock" Card of the Week program. "This is an incredible promotion and it is generating very strong support for hobby shops," said Mike Fruitman of Mike's Stadium Sportscards in Colorado. "Thanks to Topps for finding a way to drive customers into stores without the lure of autographs and jersey cards." 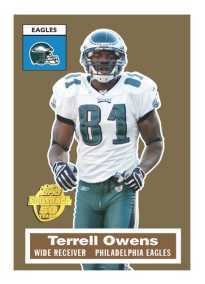 This week's featured player is the high-flying Eagle Terrell Owens.